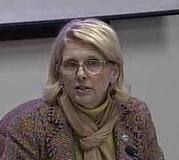 A BUBBLING CAULDRON: Schafer Denied Vector Control Board Seat! 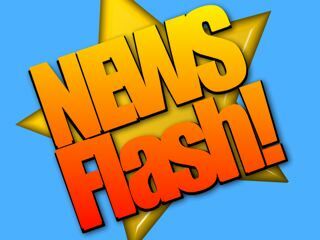 At its meeting tonight, the final item discussed was Mayor Pro Tem Wendy Leece's proposal for her to step down from the Orange County Vector Control Board so Arlene Schafer could be appointed. Schafer's appointment was rejected by a 3-2 vote, with only Leece and Gary Monahan voting in favor of the appointment. 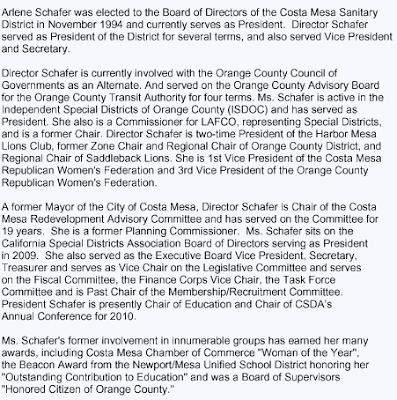 Schafer is presently the President of the Costa Mesa Sanitary District and, as a member of that organization, she's been representing Costa Mesa on several other boards and committees for decades. During her pitch tonight Leece emphasized that Schafer, by losing her Sanitary District seat to Mike Scheafer in the recent election, ceases to be eligible for the Local Agency Formation Commission (LAFCO). By appointing her to the OCVCB seat representing Costa Mesa she would have remained eligible for the LAFCO position, too. 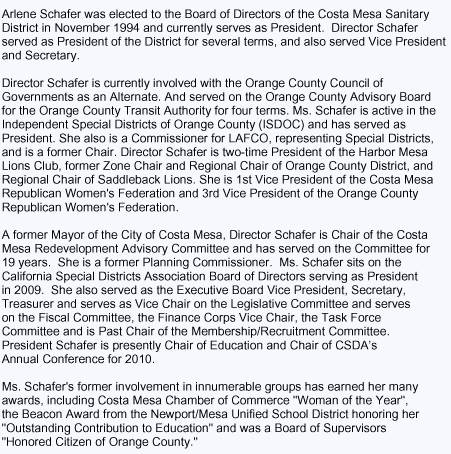 I've included Schafer's biographical summary currently contained on the Costa Mesa Sanitary District web site below. As you read through it you realize what a dedicated member of the Costa Mesa community Schafer has been for a long, long time. With this rejection her life will change dramatically and our community will lose the services of one of its most loyal and active supporters. I understand the vote tonight. It was clear that Eric Bever and Allan Mansoor both had strong reservations about the process, as did Katrina Foley. This seemed like a "quick pitch" by Leece, orchestrated by Schafer when she contacted Leece to ask her to step down from her OCVCB seat and nominate her, Schafer, to replace her on it. It certainly was an unusual move. I find it ironic that Mansoor, in his last official vote as a Costa Mesa Councilman and Mayor, gives a stiff-arm to one of the pillars of the community. Some will view this as a changing of the guard, with the last vestige of municipal governance from two decades ago shoved aside for what some in the community anticipate being a Jim Righeimer-dominated government for the next decade. We here at A Bubbling C auldron wish Arlene Schafer well, thank her for her years of service and certainly hope she will continue to find ways to support our community. Heck, she might even apply for the possible council vacancy to be created by Katrina Foley's departure next month! Wouldn't that be fun. I'll provide a more detailed wrap-up of the council meeting tonight some time tomorrow, Wednesday. You left out an important aspect of the vote - that Schafer voted against Costa Mesa's interests while on LAFCO. I didn't include a comment about that allegation because, as I listened to the discussion between Eric Bever and Allan Roeder, it wasn't clear just how accurate Bever's comment was. He's been known to play fast and loose with "facts", so I wasn't ready to give him the benefit of the doubt on this one. That's kind of what happens when you bend the facts to suit your purposes and get caught doing it. we will still most likely get someone from Costa Mesa on LAFCO. Anyone on the Board at Sanitary District or Water District is eligible. In fact, Schafer reversed a vote, in a special "re election" that cost Shawn Dewane a seat on LAFCO and gave it to someone from Irvine. I predict Dewane gets seat and actually votes for Mesa interests. Was that "standing O" for Mansoor winning his new position or everyone in attendence was so happy to see him final gone? I AM SICK AND TIRED OF BEVER TRING TO TURN COSTA MESA INTO A HOA (that stands for Home Owners Association for those of you who voted for Reeeemer). I moved out of HOA because 5 homeowners decided how the rest of us should live.